"The King" b/w "Electric Head" & "Rubbersnake"
If you head over to Dead Meat's myspace page, the band dubs their sound "reggae." If you hear their new 7," you'll understand why that's funny. 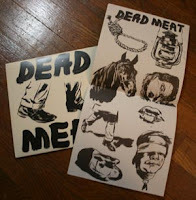 There was an immediate rush of nostalgia that sort of warmed my heart when I opened up Dead Meat's single, "The King," its Raymond Pettibon-inspired ink drawings evoking the excitement of opening up mail order packages from SST Records as an impressionable youth, subject to the visceral and irrevocable alterations those recordings would bring about. Thankfully, the expectations of its package garner results, the single reminiscent of the sort of analog-heavy six-string snarls that I remember hearing years ago: those gritty and broken notes that would act a presage to what would ultimately drive a crowd of bodies to move tantrum-like once the snare beat was enacted. "The King"'s percussive build-up ultimately leads the song through a mass of dissonant mire that's bore through by vocalist Joe Santarpia's sullen yowl, lengthy vowels and held pronunciations eerily spoken and not necessarily sung. "Electric Head" has more of a rapid approach, amplified strums and cymbal-heavy rhythm cultivating a proper ALT-sound next to the one that bands like Bush persistently attempted to emulate to no avail. "Rubbersnake" is strange in that it seems like the snippet of an otherwise larger track, highly saturated riffs and emotional fortitude established with one verse, no chorus, no real bridge. It's good, but strange. Along with the 7" comes a download code for Early Recordings, a digital-only offering that features iPod-ready versions of the single's three tracks. 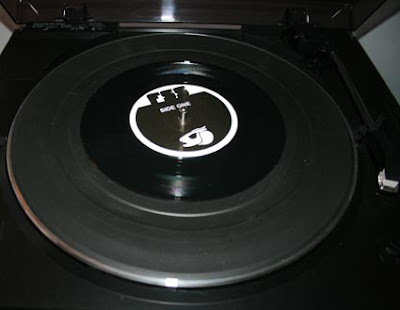 No turntable? You can buy Early Recordings separately. There's a late 80s/early 90s clarity to Dead Meat, which only offers further confirmation of the era's importance in terms of its musical renaissance, (as short lived as it was), and also conveys its place in influencing new bands and new ideas. It was after all, the last time rock rags, paper fliers and cassette tapes meant so much. Bands like Dead Meat have and continue to come to be, but in a digital age it's become easier to separate cheap imitation from genuine homage. Any band can attempt to sound like Dead Meat, but it's more than the mere riff that relaunches an aesthetic of yore, or a classic Alternative sound. There's an ability to figure out the sound's distillation, of how to capture a time and place. 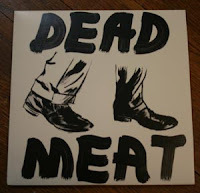 With only three songs, and one very simply illustrated 7" single, Dead Meat comes across perfectly representative of a past that will never be repeated, but can still be replicated with some integrity intact. Even when the band has a digital-only release as accompaniment, it's at least commendable to take some of the polish off digitized "perfection."